OTDS is the UK based leader in power distribution materials throughout Europe, Africa & the Middle East. Established in 1978, OTDS has vast experience with a range of power distribution networks, supplying the Oil, Gas, Utility & Mining industries in the UK & Overseas. 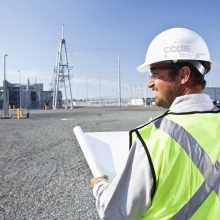 OTDS operate by supplying complete distribution networks between 240v – 132kV. We can design your entire electrical distribution network & supply all the required materials to get your project live, whatever the size. We manufacture overhead line materials, power transformers, substations, cabling, accessories & low voltage equipment, for a comprehensive, fully compatible, care free installation. At our UK offices & warehouses we hold stock of all the materials required for implementing a new distribution system. Wooden & steel poles, power transformers, overhead line hardware, termination kits and conductor, are all held in our warehouses for a quick delivery to site for emergency projects worldwide. Small enough to care but big enough to perform, OTDS has the capability and capacity to work on any contracts, large or small. OTDS enables our clients to reach their customers worldwide. Please click here to view our products and services.